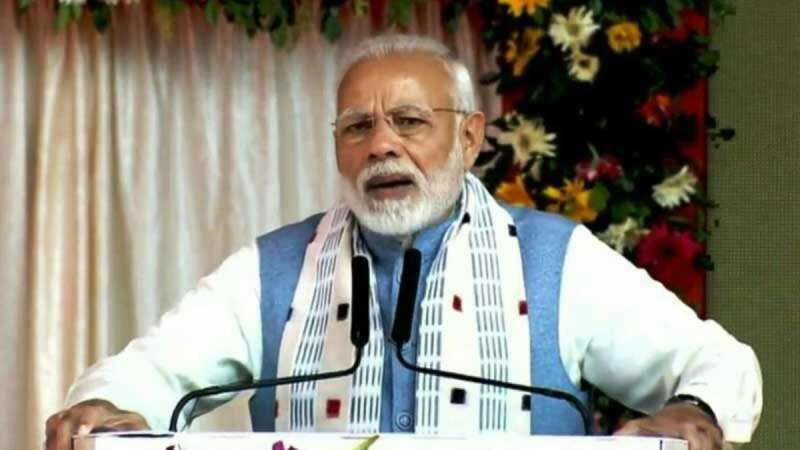 Ahmedabad : Prime Minister Narendra Modi is a master of speech; on Tuesday he attacked Opposition with an analogy on recent air strikes against terrorism. Speaking after launching a pension scheme in Ahmedabad, PM Modi said Opposition focus at strike on him, while he focuses strike on terrorism. "They (opposition) want to strike Modi, but I want to strike on terror," Modi said. "They want to remove this `chowkidar but I want to fight poverty," he added. "The honesty of your 'chowkidar' is troubling those in opposition. That is the reason they are saying Modi hatao, (remove Modi) while I am saying that I want to fight poverty and dishonesty. I am standing firm due to your support, Modi said. Taking a pot shot over Mahagathbandhan against Bharatiya Janata Party, he said Opposition parties are forming a 'mahamilavat' (highly adulterated) combine to remove him. "But I am working to safeguard interest of workers and farmers. I am also working to provide security, he said. PM Narendra Modi was in Ahmedabad to launch the Pradhan Mantri Shram Yogi Mandhan Yojana pension scheme. "This scheme is aimed at uplift of the section of society which has been ignored and left at the mercy of God. He did not miss a chance to take a pot shot on the Congress chief Rahul Gandhi and said, "they (Congress) gave slogans of garibi hatao (end poverty). Some projected themselves as messiah of workers. But during their tenure they did not launch such a scheme." "They ruled the country for 55 years and collected votes in the name of poor," he said. "They thought that poverty is a mental state. See how is this neta who says that there is nothing like poverty but a mental state," Modi said, targeting the Congress president. "For them poverty is just an opportunity to click pictures. Only those oblivious to sleeping hungry even for one night can think that it is a state of mind, Modi said, in an obvious reference to Gandhi's 2013 statement that poverty is a state of mind. "What they could not do in 55 years, this 'chaiwala' did in 55 months by bringing such a scheme," Modi said.